.......53 Buddhas and Me .................My Life Adventures.....: "Rawson"
This coming weekend I am of to an annual scrapbooking weekend away to "Rawson", which is a tiny town in country Victoria. It is hosted by a few wonderful "Creative Memories" consultants, one being Rebecca who is almost like my niece. We have a great weekend featuring lots of scrapbooking, lots of food, alcohol and huge amounts of talking and laughing. Today I have been trying to get myself organised which meant looking for which photos I wanted to scrap. As usual I got side tracked while looking at my photos, reminiscing of when they were taken. It must be because I am hanging for a break away that the holiday snapshots held my attention today. One that bought back some great memories was when Shane and I took a road trip along the "Great Ocean Road" from "Melbourne" to "Port Fairy". We had such a good time although Shane got really sick in Port Fairy and we had to make a quick dash home. The Great Ocean Road runs along some of the most picturesque and rugged coastline you would see anywhere. 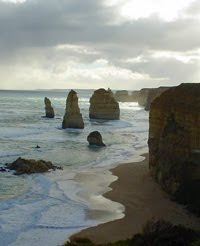 The picture I have posted is of the "12 Apostles" although there are now only 8, as over time they tend to fall down. 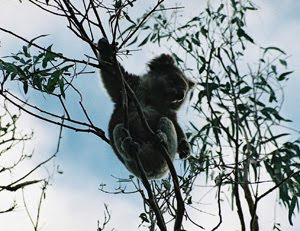 One of the highlights for Shane was to actually see a Koala in the wild. He had only ever seen then in zoos and wildlife parks. So when we came across 2 of them high up in the trees he was very very excited. They were so high I had to use my telephoto lens to get close enough to them. They are beautiful creatures even though they are asleep most of the time - or maybe just stoned from eating the eucalyptus leaves all day long. Actually I must admit I was pretty excited to see them as well. Even though they are a famous Australian native they are still pretty hard to locate in the wild. I do love them but as in a previous post, you may remember that my all time favorite Australian Native is the "Wombat". Awesome photos - the beach scene especially! 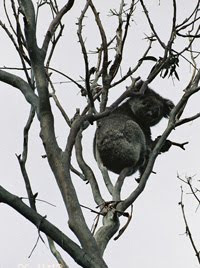 And of course who doesn't love the koala's? I saw them at the San Diego zoo up fairly close - I wanted one!!!!! Sounds like a fun weekend ahead of you, I hope that you do have a blast and I am looking forward to more photos! Hope you don't mind if I use one of the koala photos for my desktop background... they're so cute and the photos are wonderful!